JACQUELINE LUQMAN: Welcome to The Real News Network. I’m Jacqueline Luqman. Voters are laser focused on loosening the overbearing grip of big and dark money in politics. But there is another partisan tactic widely used by political parties to influence elections that few people pay attention to, but it’s one that more people should take note of. Here’s former California Governor Arnold Schwarzenegger and Maryland Governor Larry Hogan speaking on this issue at the U.S. Supreme Court. ARNOLD SCHWARZENEGGER: It is a national scandal what’s going on with the gerrymandering and the way our politicians draw the district lines. LARRY HOGAN: There are two cases here today. In one case in North Carolina where the Republicans were gerrymandering, and in our case in Maryland where the Democrats were gerrymandering, in both cases wrong. Voters overwhelmingly, some 80 percent of the people in our state, want to take this decision away from the politicians and give it to a nonpartisan redistricting commission. JACQUELINE LUQMAN: Here to talk about gerrymandering, what it is, why it’s important, and the Supreme Court case being heard on the issue right now, is Kathay Feng, the National Redistricting Director for Common Cause and the architect of the California Citizens Redistricting Commission, which is the gold standard in citizen-led redistricting. And she is the expert go-to for activists who are trying to win state-based gerrymandering addressing issues. Thank you, Kathay, for joining me today. So let’s start with the basics. Because I think we don’t understand what gerrymandering is. So can you explain what gerrymandering is for people? KATHAY FENG: Let me back it up a few steps. Every ten years, we take the census, and the next one that’s coming up will be in 2020. One of the reasons for taking the census, which is a head count of each person who lives in the United States, is so that we can then, one year later in 2021, redraw the lines for congressional districts, for state legislative districts, and sometimes all the way down to your city council districts and on down, school board and so forth. And the idea is that congressional districts should be of equal population between one district and another within a state. So we need to know where people are moving, who’s coming in, who’s going out, but we also want to make sure that as we’re drawing those lines, that we’re drawing them fairly. Now, it’s been the practice that the party in control of the state legislature has the power to draw the lines. And what sometimes will happen is that that state legislature or incumbents will lose their minds and draw the lines in a way that. Either gives themselves a significant advantage on a partisan level, or as an incumbent create, super safe districts where they don’t need to worry about challengers or anybody who might be running against them, and also where they get to do things like carve their favorite donor into their district or cut up a community that might have been interested in voting for somebody different. That process of manipulating the district lines for partisan or personal advantage is called gerrymandering. And the case that we’re now looking at, that we just argued before the Supreme Court yesterday, was looking at a particular kind of gerrymandering that we’ve seen very, very virulent in this last decade, and that’s partisan gerrymandering, where one party that controls the state legislature draws the lines to dominate state politics and congressional districts and essentially dilute the votes of the other party. JACQUELINE LUQMAN: So thank you so much for that really detailed explanation of what gerrymandering is, and I think that makes that much more clear for our viewers. But you said something that I find interesting that I don’t think voters understand actually goes on. Is it the case that political parties can implement gerrymandering whenever a new political party gains power in a state’s legislature? So does gerrymandering go on more frequently than we realize it does? KATHAY FENG: It’s a really good question. So typically speaking, redistricting happens every ten years, right after the census is taken. And the idea is, that’s when you’ve got the freshest numbers that are telling us where populations are. But it is also the case that sometimes state legislatures, in their desire to seek power, will redraw the lines even in the middle of the decade. We saw that last decade where Texas legislature changed control from Democrats to Republicans in the middle of the decade, and the Republicans said, “Hey, we’ve got the power.” Tom DeLay then pushed for a gerrymander so that his party’s representation in the state legislature and in Congress could be fully realized by redrawing the lines to their advantage. So sometimes it happens off-decade as well, so not just in the years like 2021 or 2031. JACQUELINE LUQMAN: So did the gerrymandering that we’re talking about today, was there any effect on the 2016 election, or on the 2018 election, in any of these gerrymandering efforts? KATHAY FENG: So let’s dig into the cases that were before the Supreme Court. The Supreme Court was looking at two different cases, one coming out of North Carolina called Rucho v. Common Cause, and it was consolidated with another case that was brought by liberal voters to challenge gerrymandering that was done by the Republican-controlled legislature. The other case came out of Maryland, it’s called Lamone v. Benisek, and that was a challenge of Democrats who were doing the gerrymandering. So in North Carolina, this is a state that has an unfortunate history of gerrymandering for all sorts of invalid and harmful reasons, in the earlier part of the decade they had drawn lines and essentially been found to have racially gerrymandered, that is, cut up minority communities, specifically black communities, into many different pieces, or packing them into districts so that they would have as few districts that they could elect a candidate of their choice as possible. And the lower court said, “You know what, this is a clear case of racial gerrymander, state legislature, you need to go and redraw the lines.” And so, in that instance, in 2016, the Republican-controlled legislature in North Carolina redrew the lines. And they said, in an open microphone in public hearings, they said the only reason that was motivating them to draw the lines as they were was for partisan advantage. And they not only said it into an open microphone, they passed a law that adopted a 10-3 advantage for Republicans in a state that regularly votes 50/50 between Democrats and Republicans. So that kind of lopsidedness was built into the very maps that were adopted in the criteria that the Republican legislators said that they wanted to follow. The vote followed a pure party line. And in fact, they adopted congressional lines that created that 10-3 advantage, even in 2018, when there was a blue wave sweeping the rest of the country, North Carolina’s districts did not change one bit. There was not a single pickup for Democrats in a blue wave election in North Carolina, because the districts had been very calculatedly drawn in a way that Republicans would hold that control. And that’s partly because our computers have gotten so sophisticated, and the electoral data and the ability to use big data on how voters are behaving, allows map-makers to really create very precise maps that allow them to pinpoint how they’re going to perform for the rest of the decade. KATHAY FENG: That’s exactly right. JACQUELINE LUQMAN: And they didn’t actually change the boundaries of the maps at all, they just changed the language. Is it that easy for politicians of either party to continue to perpetuate this very disenfranchising kind of practice? Is it that simple? KATHAY FENG: Yeah. Unfortunately, what’s happened is that in states like North Carolina that do not have an initiative process where citizens can push for change of laws or change of the constitution through a citizen initiated process, they have to go through the legislature. And what that means is that when you’ve got a self-interested legislature, as we do in North Carolina, they’re going to do what they want to, and the only check is the courts. In this instance, the Supreme Court has said, through several cases very recently since 2015, that they’re very concerned with the problem of partisan gerrymandering, but they are struggling, they are struggling to find a manageable standard to be able to apply to these cases to find that a partisan gerrymandering has crossed the line and is unconstitutional. And so, in the absence of a clear role, state legislatures have become more and more brazen. And in North Carolina’s instance, the state legislative leader basically said, “You know what, I know it’s illegal for us to racially gerrymander, but I haven’t heard you say that it’s not OK for me to gerrymander for partisan advantage, so that’s my excuse.” It’s almost tantamount to saying, “Hey, judge, I didn’t rob that grocery store, and my alibi is that I was busy next door robbing the First National Bank.” That’s their excuse. And for many years, the Supreme Court has said, “We’re a little concerned about wading into the political thicket, we don’t want to try to choose who the winners and losers are between Democrats and Republicans.” And so, they’ve been hesitant to step into this very complicated issue. But the reality is that they have heard redistricting cases again and again, they’ve been able to rule, as have lower courts, we’ve got clear standards for what it means to hold that the First Amendment protects against the government discriminating against people based on their viewpoint. And we also have a lot of cases that use evidentiary standards to find that redistricting must be overturned because there’s been gerrymandering. And so, the reality is that this is an instance where if the Supreme Court doesn’t speak up and articulate the clear constitutional basis and a standard for them to find that the North Carolina. Gerrymandering is unconstitutional, we are going to have an open hunting season with no bag limits, and the legislature will go hog wild. They’ll just do what they want to do, which is basically, under the pretense of protecting their own party or incumbents, they get to draw the lines however they want to. And unfortunately, in many states, there will not be a check. Courts won’t feel like they have no ability to slow that illegal or unconstitutional behavior down until the Supreme Court changes its mind. JACQUELINE LUQMAN: So just to make sure that we don’t present this as a GOP issue, just to make sure that we’re not being partisan in reporting this problem≤ we need to make clear that this is an issue that affects both political parties. What is going on with the case that is before the Supreme Court that came out of Maryland? KATHAY FENG: On the same day that the Supreme Court heard oral arguments, Rucho v. Common Cause, where we were challenging the North Carolina gerrymander that was done by Republicans, right after that, the Supreme Court heard the case of Lamone v. Benisek, where the challenge was against Maryland Democrats who had done the gerrymandering. And there, the Democrats also, out loud, brazenly said that they were trying to achieve a 7-1 advantage for Democrats, where it used to be it was 6-2. There were going to take away one of the few seats that the Republicans had, and they were going to do that by creating this long, stretched up district that went from the suburbs of Washington, DC and stretched up to the northern border of Maryland where it’s rural and largely on the border of West Virginia. It feels much more akin to West Virginia’s population and communities than it does to the suburbs and urban area of Washington, DC. And so, this stretched-out district ended up removing 350,000 Republicans, and bringing in 360,000 Democrats, thereby flipping the district for Democrats. It was so obvious. And what’s interesting is that in the Supreme Court, there were two justices who really focused in on this district, the 6th district, because this happens to be their backyard. Justice Kavanaugh and Chief Justice Roberts asked a lot of questions on this case to try to understand if in fact the explanations for why they drew the lines the way they did were true, they were trying to bridge something that was crossing the Chesapeake Bay, or if it was just excuses to justify what was essentially a partisan power grab. And Chief Justice Kavanaugh practically scolded the attorney for Maryland who was trying to justify these partisan gerrymanders that the Democrats had done, and said, “Look, let’s call it what it is, please stop trying to run away from the reality that this is a partisan gerrymander.” And he proceeded to say, “I know these districts, I know this district, and it doesn’t make sense that these several counties have been lumped in together, because they don’t really share any interests and it doesn’t make sense from anybody who knows the geography of Maryland.” Well, one of the benefits of bringing the Maryland case is not just that it provides a nice counterbalance to North Carolina to be able to think about this issue in a bipartisan way, the other benefit is that it’s in the backyard of several of the justices, including Chief Justice Roberts and Justice Kavanaugh. They know this district like the back of their hand, they know the areas that are impacted, and they understand how ridiculous it is that the district was drawn this way. JACQUELINE LUQMAN: It’s very interesting that Kavanaugh, who drew so much criticism over his confirmation, would be the justice who’s asking the most pointed questions, and as you said, is scolding the attorneys in trying to justify this gerrymandering effort. The other a conservative justice who raised an issue that I want to ask you about as the last point, which I think is very interesting and important, is Justice Neil Gorsuch, who said that perhaps a way to address this issue of gerrymandering is to appoint independent commissioners to redraw or redistrict these maps outside of both political parties. This is interesting, because the Democrats just introduced H.R.1 in the House of Representatives, otherwise known as the For the People Act, that’s what it is entitled, which actually calls for independent redistricting commissions to redraw these congressional districts that have been so badly gerrymandered by both parties. What does it mean when a conservative justice brings up an issue that is called out as a solution in a in a Democratic piece of legislation. What does that mean? I don’t want to read anything into it. What do you think that means? KATHAY FENG: Well, I think that there’s two ways of understanding this. One is that Gorsuch is being sincere. He comes from the state of Colorado. 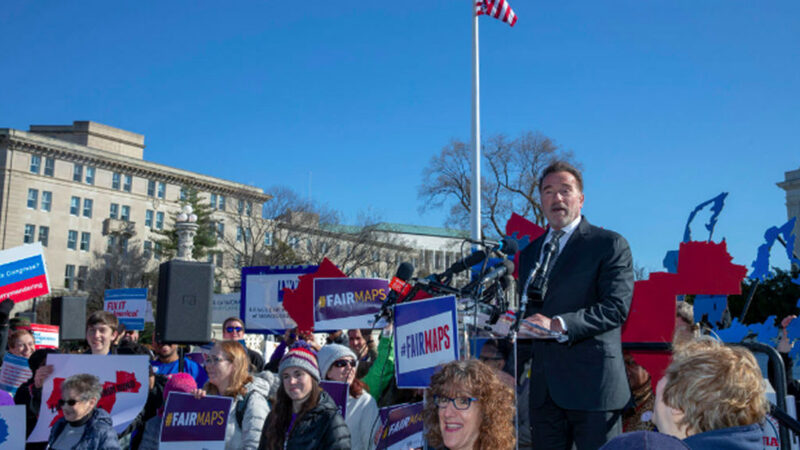 Colorado was one of the five states in 2018 team that adopted redistricting reform. The other four were Michigan, Missouri, Ohio, and Utah. And those states, as I just set them, you can hear that they span kind of from purple to red. They don’t fit the normal profile for who might adopt this kind of redistricting reform. They all adopted some type of redistricting reform that made the process more transparent, more inclusive of citizen input. But the reality is also, and this may be another way of interpreting it, is that you can’t count on states, or citizens and states, to be able to heal the problem of partisan gerrymandering. They kept referring to a comment that had been made before by Sandra Day O’Connor about self-healing, partisan gerrymandering will self-heal. And the reason is that number one, less than half of the states have an initiative process. So what do you do with the other half of the states, where the only way to change the practice is either through judicial action or through a changing of the state constitution, which in many states, is very, very arduous. It requires two votes of the legislature, so two different sessions of the legislature have to vote for something, set aside their own self-interest or their partisan interests, and vote to do something on a principled manner. And also, many states have a third step, which is sending it to the vote of the people. So the challenge is that the road to that kind of amendment for the rest of the states is very, very difficult, and there have been very few instances where state legislatures who are not pressured by some kind of outside initiative process have acted on their own to create a true, transparent, and fair process. So what are we left with? We’re left with a handful of states who have commissions, and then most of the states, particularly east of the Mississippi, who have no initiative process, who are basically stuck. They’re stuck being beholden to the whims of a state legislature who, on a good day, might decide that they want to be a little bit magnificent towards the voters and try to draw the lines in a slightly fairer way and on a bad day, people will be shut out of the process because the state legislatures will do what many state legislatures do, and that is exercise the power to draw the lines however they want to, including for incumbent advantage purposes or partisan advantage purposes. And what’s interesting is that if another lawsuit challenging one of these new states that has adopted a commission style, a process, gets brought, I’m not confident that some of these conservative justices, who right now say, “Oh, this is the way that we’re going to self-heal partisan gerrymandering,” they’re not going to be some of the first votes for dismantling these state-created citizen commissions. And so, I think that our challenge is that ultimately, there are some other justices who feel very sympathetic to politicians being able to draw their own lines, even if it’s at the expense of voters being able to choose their politicians. And unfortunately, in this very polarized political context, that can have some very ill effects on our democratic representative government. JACQUELINE LUQMAN: Thank you so much for joining me today to explain this really, I think almost in a way, obscure topic, but extremely important topic that voters should be paying attention to. We will continue to watch this case. Kathay Feng, thank you so much for joining me today on The Real News Network. And thank you all for watching. This is Jacqueline Luqman for The Real News Network in Baltimore.